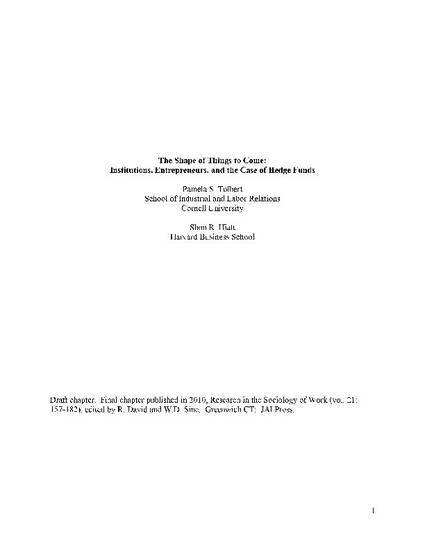 Foundational work on institutional theory as a framework for studying organizations underscored its relevance to analyses of entrepreneurship, but entrepreneurship research has often ignored the insights provided by this theoretic approach. In this chapter, we illustrate the utility of institutional theory as a central framework for explaining entrepreneurial phenomena by discussing three primary questions for entrepreneurship researchers: Under what conditions are individuals likely to found new organizations? What are key influences on the kinds of organizations they found? And what factors determine the likelihood of the survival of new organizations? We describe the kinds of answers that an institutional perspective provides to these questions, illustrate some of our arguments by drawing on a recent field of entrepreneurial endeavor, hedge funds, and discuss the implications of our analysis for further work by entrepreneurship researchers. Copyright held by Elsevier Science. Final version published as: Tolbert, P. S. & Hiatt, S. R. (2010). The shape of things to come: Institutions, entrepreneurs, and the case of hedge funds. Research in the Sociology of Work 21, 157-182.